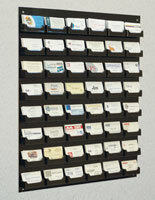 These business card holders, including contact card cases and organizers, offer much in the same way as our brochure pockets. 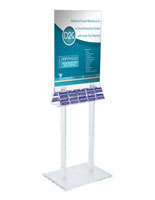 They do a great job or organizing these small pieces of information into presentable stands and racks for patrons or customers. 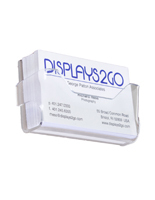 Personalized business card holders come in all sorts of iterations, from desk top to wall mount, in single pockets or multi-pocket. 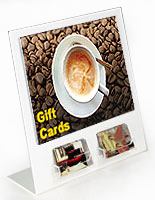 Their uses are many but probably their most important use is to help you market your business or services. 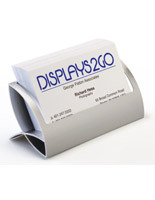 Whilst brochure pamphlets highlight new products or company literature, the business card provides the contact info that leads to a person. 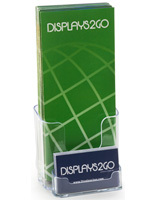 B2B and B2C commerce relies on personal relationships, whether with a direct customer or a vendor or supplier. 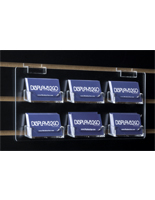 Business card holders and racks help to project a professional image, an important consideration in any business endeavor. 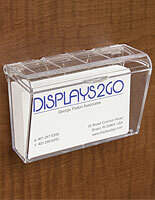 What types of contact card cases are available for purchase? 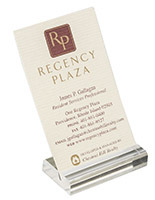 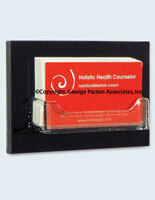 Desk business card holders are a staple for any office worker or customer service representative. 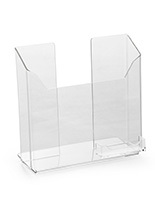 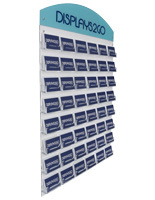 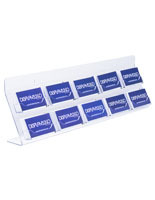 These organizers offer the most variety and range from a single-pocket stand up to multiple-tiered displays that can hold nine different cards. 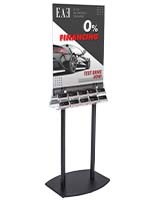 While the single pocket is the obvious choice for one person, the multi-pocket racks are intended for an entire sales team under one umbrella. 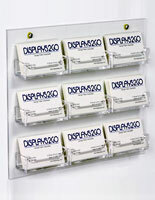 Wall-mounted organizers take the desk accessories a step further by reducing countertop clutter. 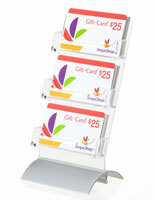 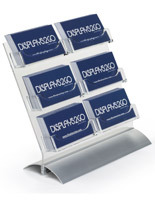 If table space is an issue, you can still display your cards for customers within easy reach. 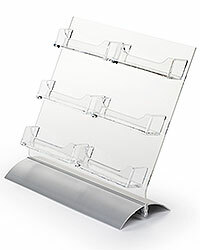 And like the desk top models, these wall racks come in single and multiple-pocket styles. 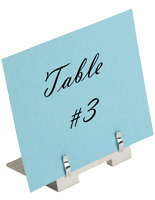 The third style incorporates the best of both worlds. 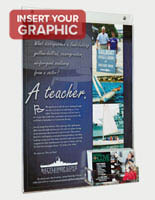 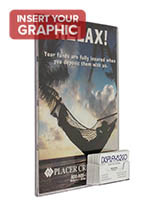 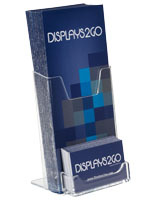 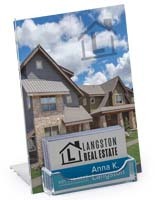 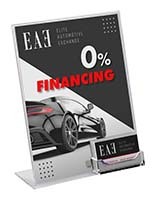 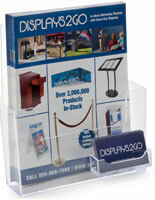 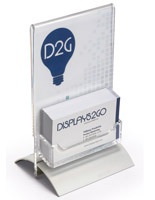 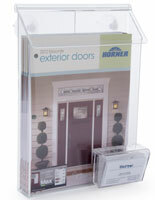 While we specialize in displays for brochures, marrying them with card holders can create a solid marketing strategy. 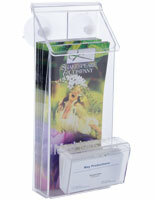 We take a card pocket and adhere it to the front of either a sign stand or literature pocket. 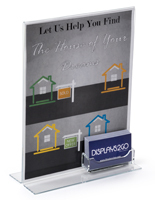 This provides the viewer with important marketing information in the form of a pamphlet or flyer, with the added convenience of your contact info in close proximity. 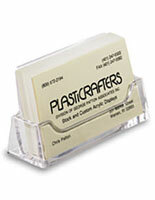 Most of our contact card cases are fabricated from either heat-formed or injection-molded acrylic plastic. 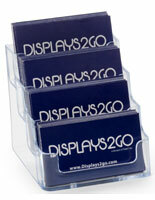 The dominant color is clear, however we do offer a handful of styles in black and other colors. 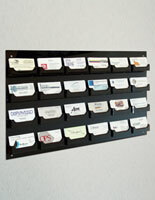 For a multi-pocket business card container, you have a couple options. 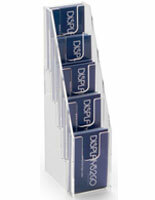 Desktop varieties feature tiered designs, where the cards get stacked behind each other in the form of steps or stairs. 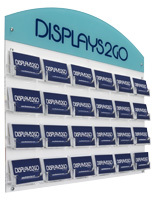 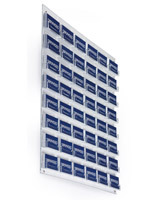 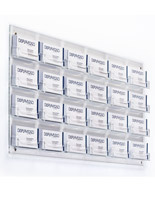 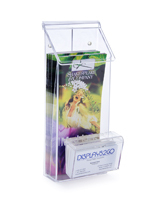 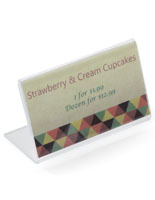 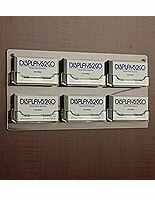 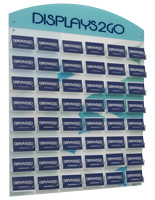 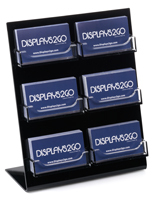 Wall mounted holders are designed with single card pockets arranged in an array on a single sheet of acrylic plastic. 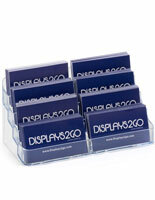 For a more upscale alternative, choose the desk accessories made from solid oak wood. 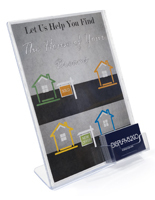 These are offered in three versions, ranging from three to nine pockets, and they come in three different stained finishes: light oak, medium oak, and red mahogany. 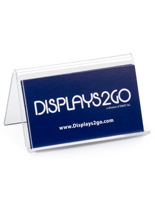 The truly personalized cases are the ones one carries in their pocket, not unlike a wallet. 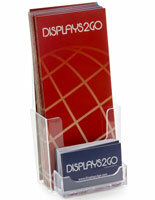 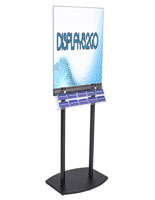 While attending a trade show or making a sales call, a portable holder is extremely convenient. 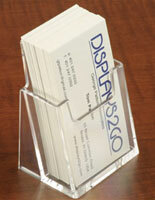 Simply whip out the card case and hand over a card while you speak. 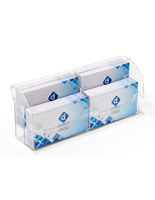 A business card container that holds one person's cards is also a personalized thing, but the focus gradually shifts when utilizing multiple-pocket displays or those with brochure pockets to a more sales & marketing strategy. 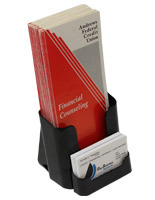 Consider these contact card cases when browsing the website for leaflet holders, they go hand in hand in today's business world.